I want to like Greek yogurt, I really do. I’d love to start each morning with a heaping bowl of super healthy 0% fat Greek yogurt drizzled in community fair trade honey and sprinkled with oaty granola. But alas, I’m just more of an eggs and turkey bacon or cream cheese slathered bagel kinda morning person. I’ve tried, I really have. I’ve attempted to introduce the Grecian parfait in small portions. The first bite is always promising. I think, “Wow, this is easy!” By bite number 3 though, that tannic, sour, bland flavor gets the best of me and I end up wasting yet another ramekin of Greek yogurt. I know, I’m weak. For every ounce of me that doesn’t like Greek yogurt, I like dip that much more. Guacamole, artichoke, eggplant, you name it. Most of all though, I love caramelized onion dip. The super creamy and oniony flavor tastes like heaven on a good old-fashioned Ruffle. The salty chips are addicting enough, but dipped in a bowl of mostly sour cream and butter saturated onions, there’s no helping yourself from downing the bag and cleaning the bowl. In preparation for my recent Porchwarming Party, I set out to solve both of these problems, the first being my distaste for Greek yogurt and the second being my insufferable addiction to caramelized onion dip. 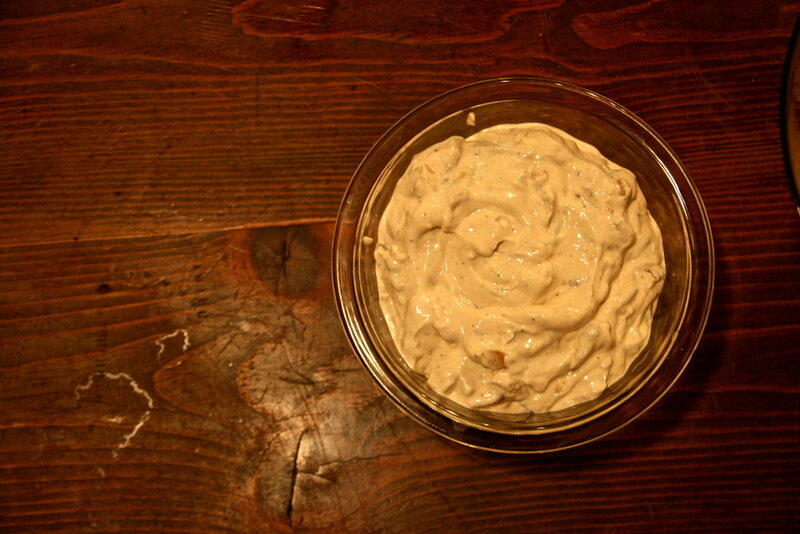 So here you have it, Healthier Caramelized Onion Dip. Heads up, I couldn’t totally kick the sour cream out of the party. While plain Greek yogurt is sour and creamy, the sour cream ties everything together and ensures that your dip is more of a dip than a savory parfait. The result was a salty and sweet, creamy and tangy dip that is just as addictive as the standard recipe without all the regret and self-loathing. This dip (and the porch) were well received. I may not have knocked my addiction to caramelized onion dip nor my distaste for yogurt parfaits, but then again, I guess I wasn’t trying too hard. 1. Cut the tops off your onions. Remove peel. Slice onions in half, pole to pole. Place flat side down on a cutting board. Slice into six sections, again, pole to pole. Separate onion slices from one another and set aside. 2. In a large, heavy-bottomed skillet, melt butter over low heat. Once butter has melted. Add olive oil. 3. Add onions to skillet, tossing to coat. Keep heat low, and continue tossing and turning the onions for ten minutes. 4. Sprinkle a pinch of sugar into the pan to kickstart the caramelization process. 5. Continue tossing and turning onions, doing so every other minute, for thirty minutes. Onions are caramelized when they’ve turned brown and become extremely flimsy and small. Turn heat off and set aside. 6. In a medium sized mixing bowl, combine yogurt and sour cream. Using a rubber spatula, add onions to bowl and stir vigorously. You should see that the color of the dip is beginning to turn a little brown. 7. Now, add the seasonings and soy sauce. Stir to combine. Taste your dip and decide if it needs more of any of your seasonings. 8. Once you’re satisfied with the flavor, place in the refrigerator for thirty minutes to an hour to allow flavors to meld. Serve chilled with your favorite potato chips.